The first lock at Daisy Nook, looking south, with Waterhouses Aqueduct just visible behind. The man is Tommy Stanfield, lock keeper and canal worker. 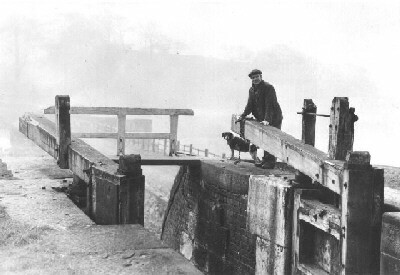 While we have been gathering together old photographs of the Hollinwood Branch we came across this evocative picture of a chap leaning on the balance beam of Lock 19, the bottom lock at Waterhouses (now Daisy Nook), with his dog, also looking towards the camera. We wondered who he might be and why his photo was taken at that lock. The picture was included in a slideshow of old photos as part of our recent canal day at Daisy Nook Country Park. Imagine our surprise when a lady watching the photos piped up "That's Tommy Stanfield and his dog, Jip!" The photograph, it seems, was taken shortly before or after World War II. It turned out that Thomas Stanfield was, at this time, the Waterhouses lock keeper and lived in one of the cottages alongside the staircase locks at Waterhouses. He lived in the right hand of the two cottages, with his wife Lizzie (Elizabeth) and daughter Elsie. He also had an older son who had left home and was then in the Army. Living in the left hand cottage at this time was the water bailiff, Sammy Pearson, with his family. The pound above the staircase locks, now used for fishing, is known as Sammy's Pool (or Basin). One of Sammy's daughters, Winifred Pearson, used to play with Tommy's daughter, Elsie, who was a couple of years younger than Winifred. Maintenance boat at the Bay Horse, Cutler Hill. Tommy is on the right. Tommy worked for the railway company that owned the canal in the early part of the twentieth century. His duties also included working 'on the bank' with the other railway company workers doing general maintenance. Indeed, Tommy also appears in another old photograph, showing the crew of a maintenance boat. Tommy is on the right in the photo. 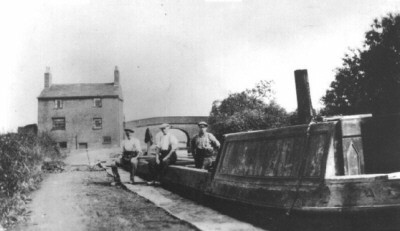 When the Hollinwood Branch was closed, Tommy went to live for a while in one of the canal workers' cottages at Portland Basin, opposite what is now the Museum, where he continued to work on the maintenance of the canal. When he retired, Tommy went to live in Guide Bridge, not too far from Droylsden, where he had many relatives. His daughter Elsie married a lad from Birmingham. How did we find this out? The lady who recognised Tommy's photo was none other than Sammy Pearson's daughter, Winifred! Also read "A Droylsden Childhood and the Hollinwood Canal".. If you have any memories of the canal that you would like to share please send them by email (see home page).